Actual size of book - 6" x 9"
"The primary objective of this book is the presentation and advancement of knowledge of many of the top Morgan Dollar die varieties. The evolution in the study of a series requires a more in depth understanding of those coins. Not just that they exist, but how and why they were created and what factors contributed to their creation. The first chapter explains what criteria was used to select the top varieties. The beginning of the book presents the die making process and provides an analysis on each type of die variety and how it is created. Approximately 70% of the number of Morgan Dollar working dies used by the Philadelphia and branch mints was uncovered and is presented. For each of the top Morgan Dollar die varieties, a complete description of the variety, including all doubling, repunching, clashing, or any other part of the variety, describing in detail the design elements and other parts of the coin affected. Multiple detailed micro-photographs showing the die variety and also key diagnostics to help identify and distinguish the variety from other that are similar. All diagnostics and where applicable, the die stages. Comments that primarily focus on how the die variety was created, but also present other interesting helpful information. Pricing, cross references, and the primary point of interest. One of the most useful tools in a die variety book is clear photographs displaying the variety; this is one of Flynn s primary forte, close up photographs. The National Archives contains letters from those individuals who were responsible for all aspects of the creation of the design, working dies, machinery, striking of coins, and rules and regulations enforced at the mints. These letters can help us learn a great deal about our coins. For examples, correspondence between the Philadelphia and branch mints show that between 1885 and 1898 the branch mints were required to return all working dies to the Philadelphia Mint at the end of each year. Chief Engraver Charles Barber would then determine if unused reverse working dies could be resent to the branch mints. For example, 10 pair of dollar working dies were sent to the Carson City Mint in 1893 with 10 pair returned in January of 1894. Five of the reverses were unused and saved for future use. These eventually became the 5 reverses that were used by the New Orleans Mint in 1900 and became the 1900-O/CC varieties. There are approximately twenty-five known 1880 Morgan Dollars; the most for any one year in any series. Letters found in the National Archives showed the only time these overdates could have been created. Many of these 1880 Morgan overdates have diagnostics which are not seen on other overdates and were the key to unraveling the mystery on how these overdates were created. 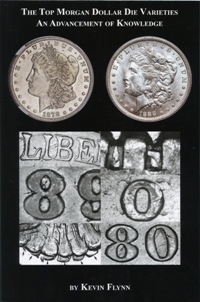 There have been several die varieties that have been misattributed, such as the 1898-O VAM 20 that was simply called a repunched date and is actually the only known large/small date in the Morgan Dollar series. Other varieties have been absolutely refuted such as the 1882-O VAM 3, 4, 5, which cannot be the result of an underlying S mint mark. These are presented along with a complete analysis on these varieties. This includes four different stages of the 1882-O VAM 3 EDS. For some varieties such as the 1899-O Micro O and 1900-O/CC, as there are several varieties of each, all known varieties are presented with detailed photographs and complete diagnostics to make distinguishing, even in lower grades much easier."